The spleen is a tongue shaped organ within the abdomen that removes and processes aged red blood cells and bacteria from the blood. In addition, the spleen is a reservoir that stores blood in the event that the body suddenly needs it. Humans and animals can live normal lives without a spleen. A splenic tumor is a mass or lump within the spleen. Overall, two-thirds of all splenic masses are malignant and of these, two-thirds are hemangiosarcoma. If a patient presents with a splenic mass and internal bleeding, there is a 76% risk of having a malignant splenic tumor and 70% risk of having hemangiosarcoma. 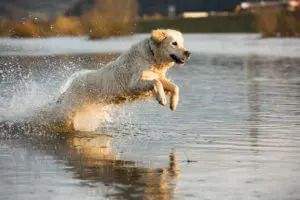 Hemangiosarcoma, a tumor that originates from blood vessels, is a malignant tumor that commonly spreads to the liver, lungs, heart, brain, spinal cord, skin and muscles. Other less common malignant tumors that affect the spleen include lymphosarcoma, leiomyosarcoma, fibrosarcomaand mast cell tumors. Benign masses of the spleen most commonly are hematomas (a bruise). Splenic tumors tend to affect older (8 to 10 years) German shepherds, golden retrievers, Labrador retrievers and poodles. Clinical signs of a splenic mass are commonly due to rupture of the mass and internal bleeding. These signs, which come on suddenly, include acute weakness or collapse, pale gums and a rapid heart rate. As the internal bleeding progresses, the abdomen becomes distended with blood. Abdominal X-rays usually show a mass in the spleen and free fluid (blood) within the abdomen. A fluid sample collected from the abdomen will confirm internal bleeding. In some cases, ultrasound of the abdomen will be recommended to further evaluate the tumor. The ultrasound may show nodules (masses) within the liver. Benign nodules are commonly found in the liver of older dogs, which could lead one to falsely assume that these are metastatic tumors. For this reason, we usually recommend exploratory surgery (and biopsy) of the suspicious masses in the liver. Chest X-rays are necessary to identify visible spread of the tumor into the lungs. It is important to note that microscopic spread of cancer cannot be detected with any imaging modality (X-rays, ultrasound, CT scan, MRI). Blood tests are also necessary prior to surgery to ensure that the internal organs are functioning well and to ensure that your companion does not need a transfusion prior to surgery. Initially, your companion will be assessed, and intravenous fluids, artificial plasma (hetastarch) and potentially blood transfusions may be required to reverse shock and anemia. The spleen is removed via an abdominal incision. Commonly, hemostatic staples are used to seal the blood vessels of the spleen, therefore you should not be alarmed if an X-ray made after the surgery shows metal staples within the abdomen. After the surgery, blood pressure, EKG, and other vital signs will be monitored to ensure that your companion has an uneventful recovery. Intravenous fluids are administered for hydration and to maintain blood pressure. 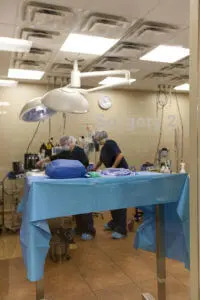 Most pets will stay in our hospital for 24 to 72 hours after surgery. Surgical removal of the spleen containing a benign mass will be curative. If the patient has a malignant tumor of the spleen, surgery will typically extend the life of the patient for two to three months. There are various follow-up chemotherapy protocols with varying resulting survival times ranging from 140 to 202 days.